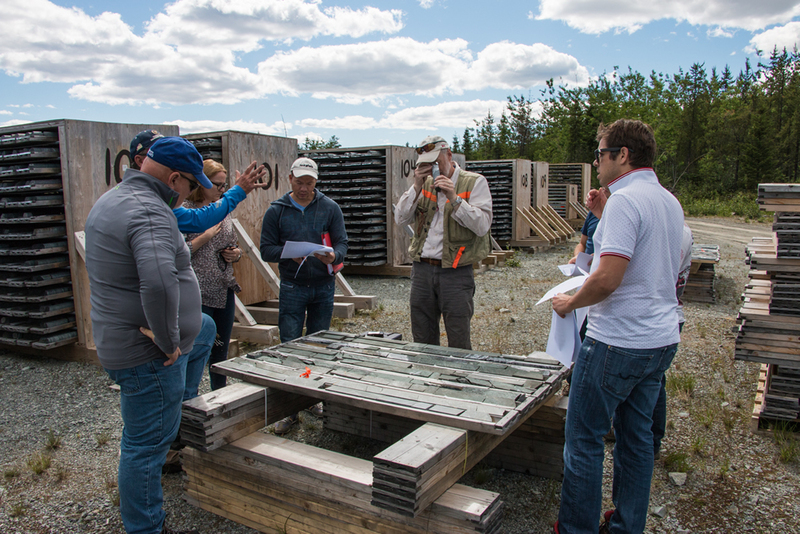 Eastmain owns a 100%-interest in the Clearwater Property, host to the Eau Claire gold deposit and project, one of five known gold deposits in the James Bay region of Québec. 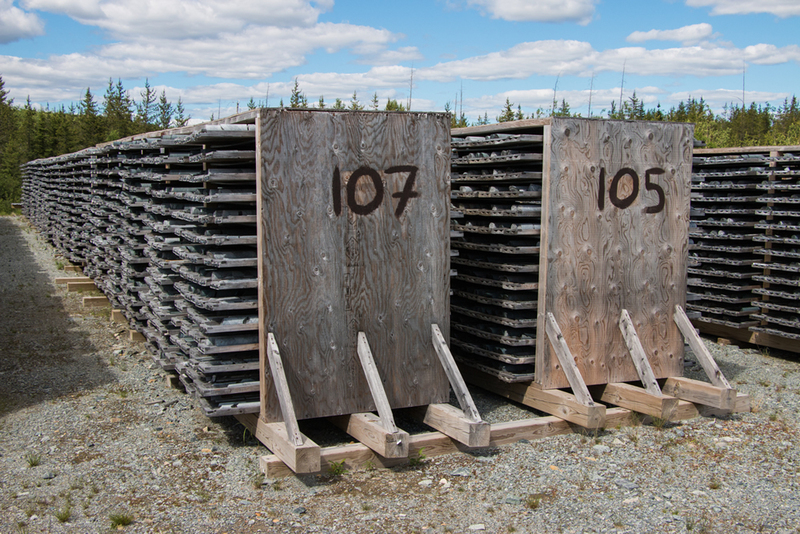 The largest of these, the Goldcorp Inc. owned Éléonore Mine, located only 57 km due north of the Eau Claire Project (2018 forecast production of 400,000 ounces of gold). 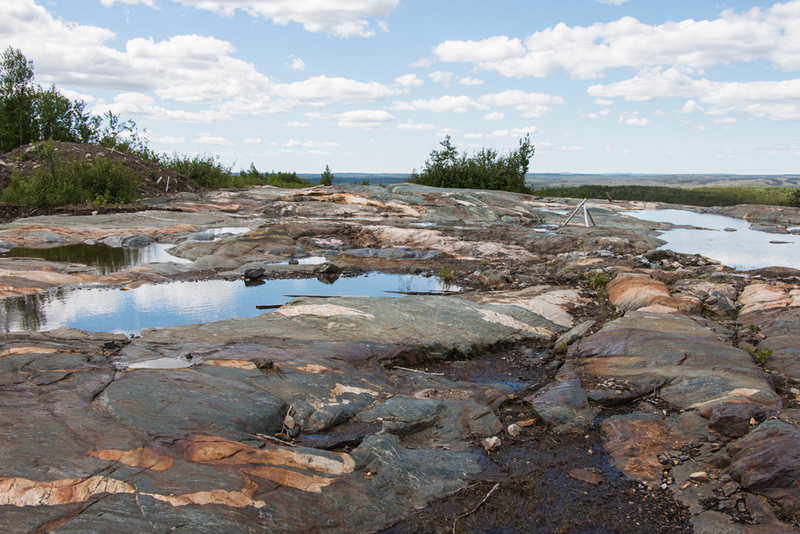 The Clearwater Property is located immediately north of the Eastmain Reservoir, 10 km northeast of Hydro Quebec's EM-1 hydroelectric power facility, 80 km north of the town of Nemaska and approximately 320 km northeast of the town of Matagami and 800 km north of Montreal in the James Bay Region of Québec (UTM NAD 83, Zone 18: 444,000E; 5,785,000N). 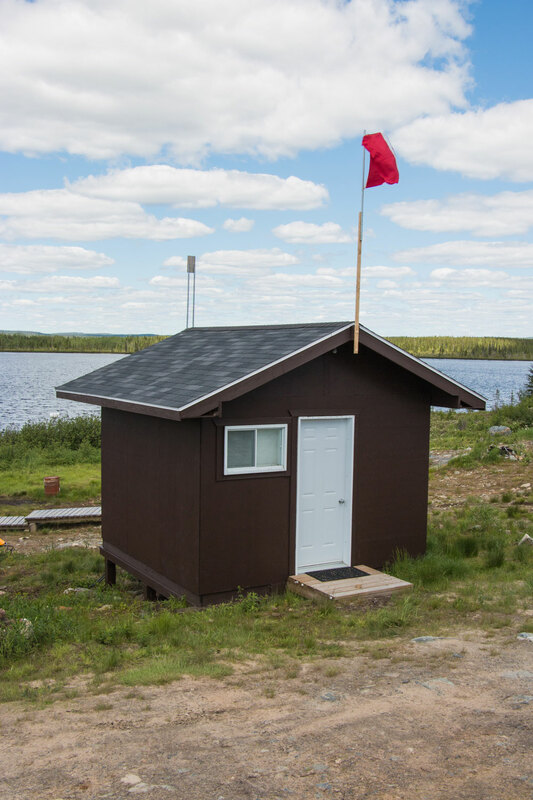 This property consists of map-designated claims, (CDC’s) totalling approximately 220 km2. These claims are held 100% by Eastmain. All claims are currently in good standing through to 2020. The Property is not subject to any historic environmental liabilities. 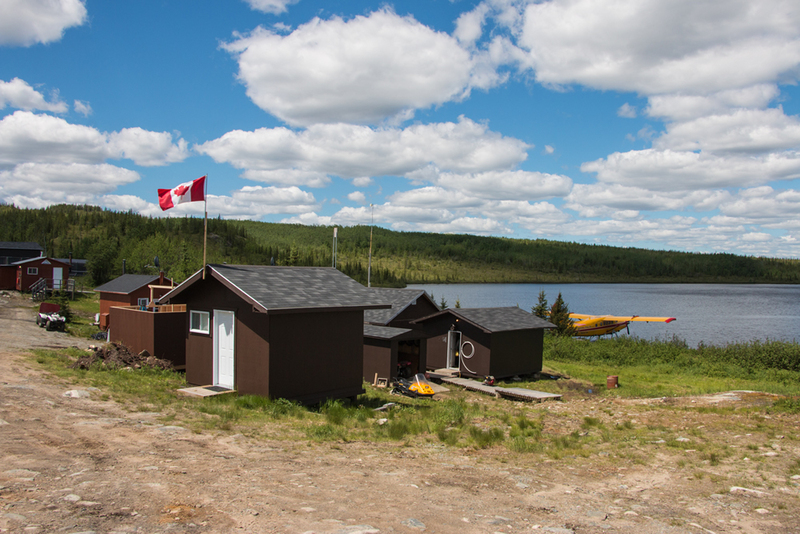 Permits are obtained annually for the Clearwater camp site and as needs dictate for all surface exploration, particularly trenching and drilling, undertaken on the property. 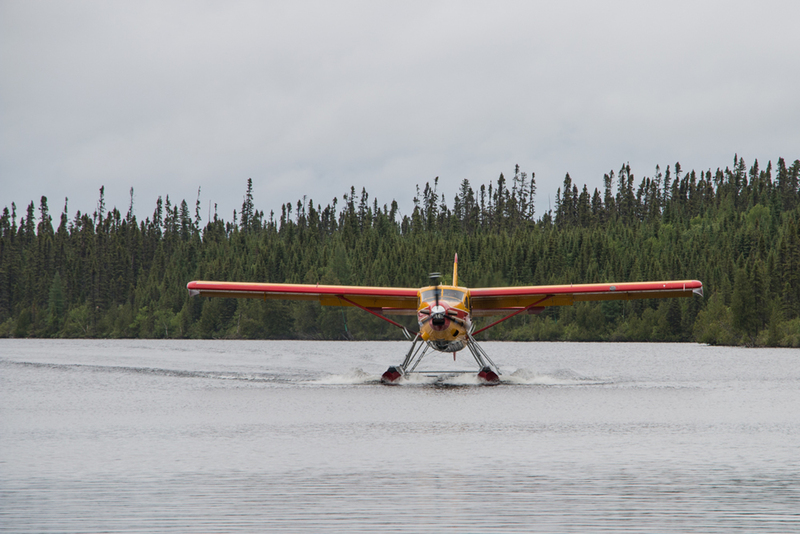 The Property is located 80 km north of a commercial airport at Nemiscau and less than 10 km northeast of Hydro Québec's EM-1 complex. 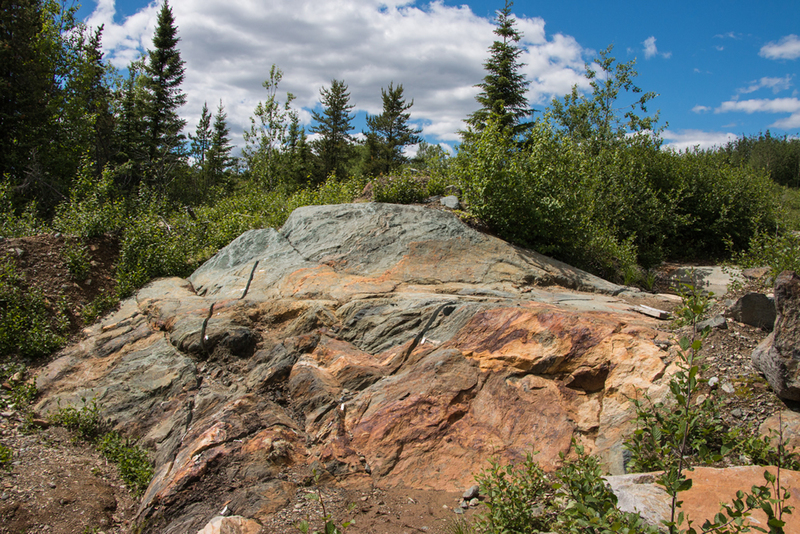 The Eau Claire gold deposit is situated at the western end of the property 2.5 km from Hydro Québec's nearest service road. 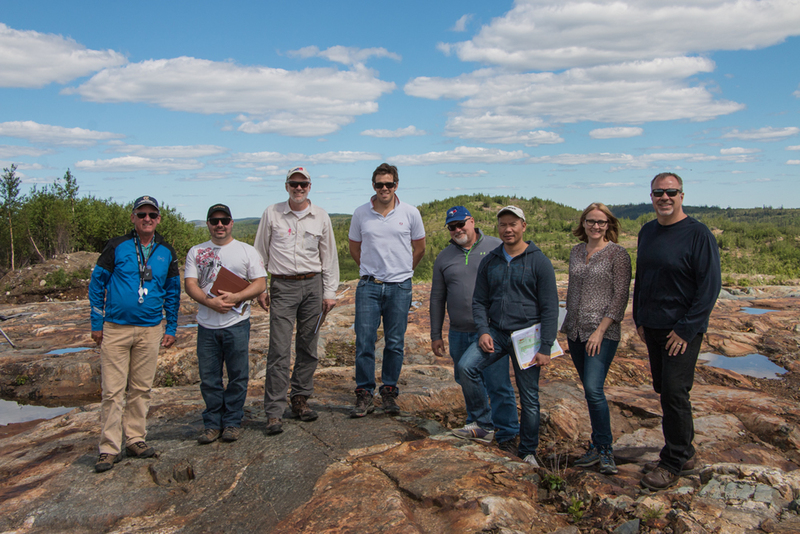 The property is accessible by the all-weather Route du Nord from the town of Chibougamau to Hydro Quebec's Eastmain One power generation complex (EM-1). 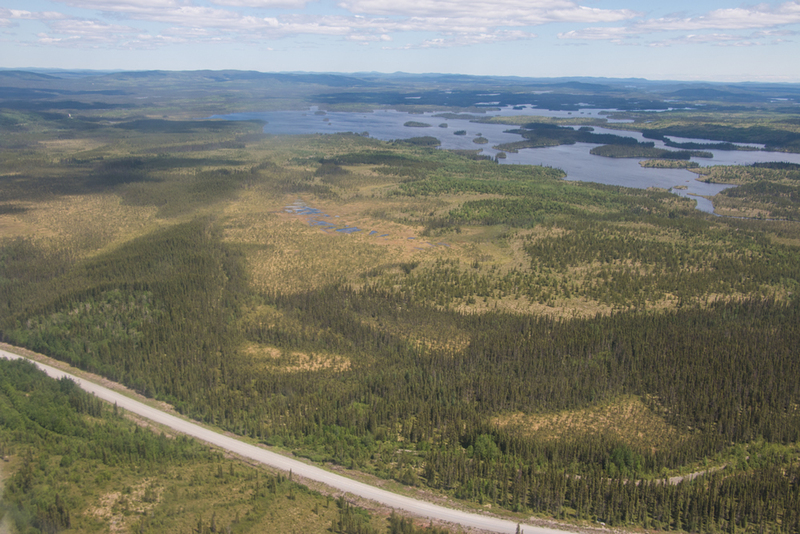 Alternatively, the property may be accessed from the town of Amos via Mattagami and the Route de la Baie James and the Route du Nord. 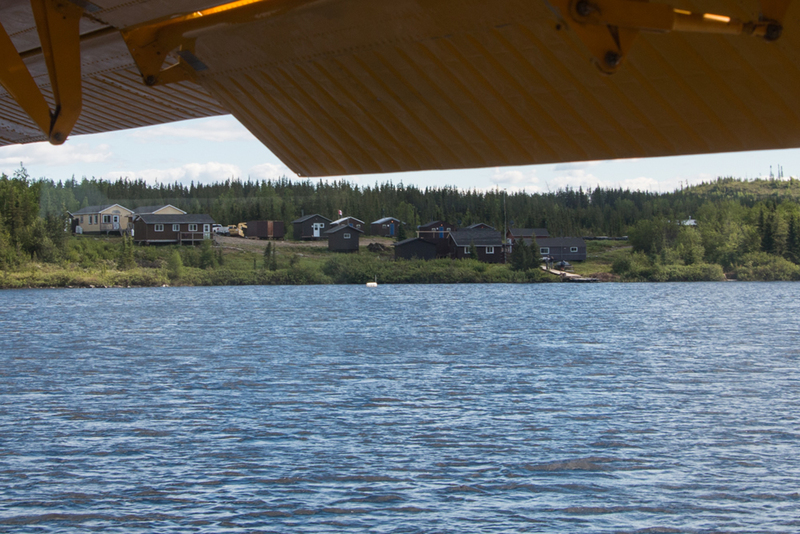 The Nemiscau Airport, located 80 km due south of the Property along the Route du Nord, has several commercial flights per week from Montreal. 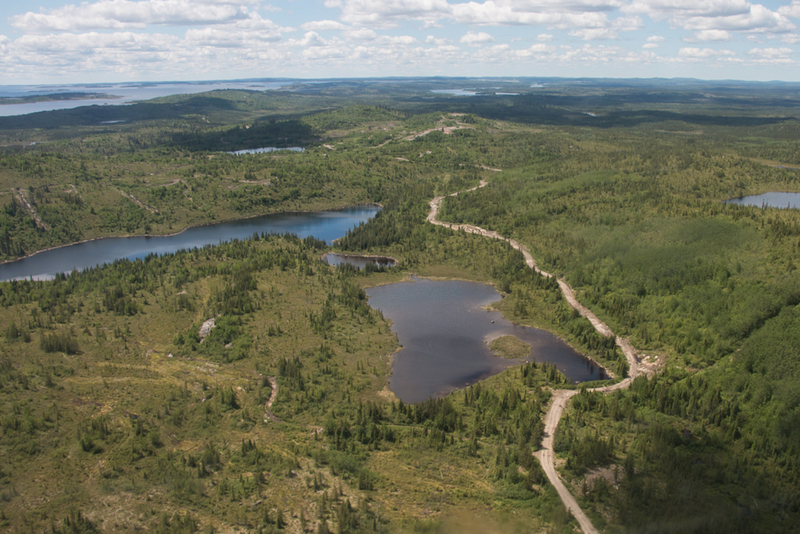 Road access reaches the southern boundary of the property, five km east of Hydro Québec’s principal EM-1 dam, located on the Eastmain River. 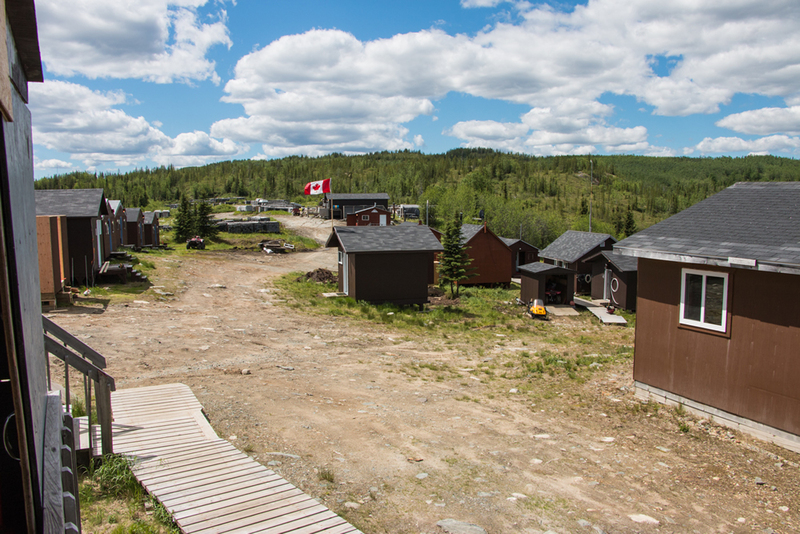 The base camp is accessible by four-wheel drive truck, ATV or snowmobile. 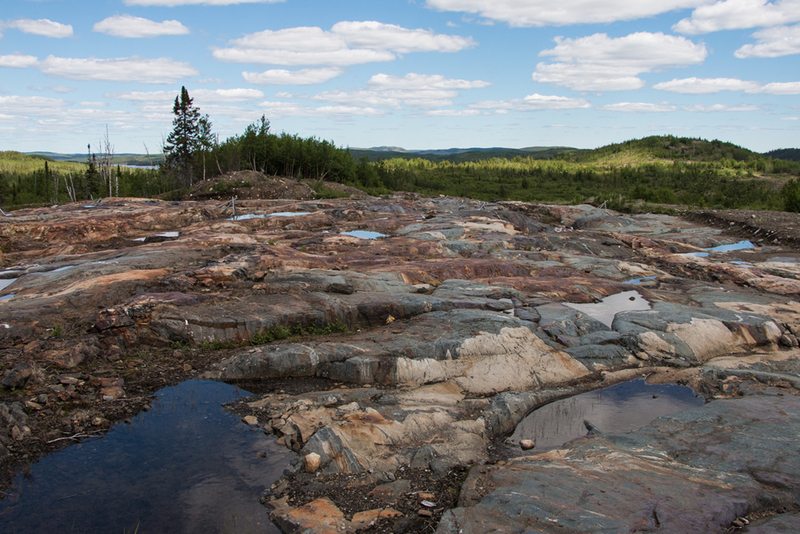 The area is well known for its extensive hydroelectric complex and associated infrastructure. 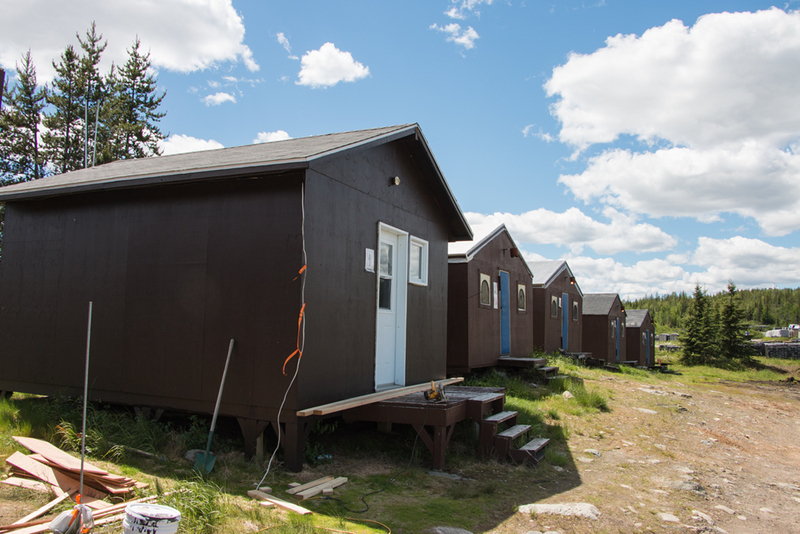 Hydro-Québec’s EM-1 Power Project currently includes a 100-person camp with full amenities and medical support. The principal dam is situated near the junction of the Eastmain and Eau Claire Rivers. The Eastmain reservoir for the EM-1 hydroelectric power facility covers a large area immediately south of the Clearwater Project. 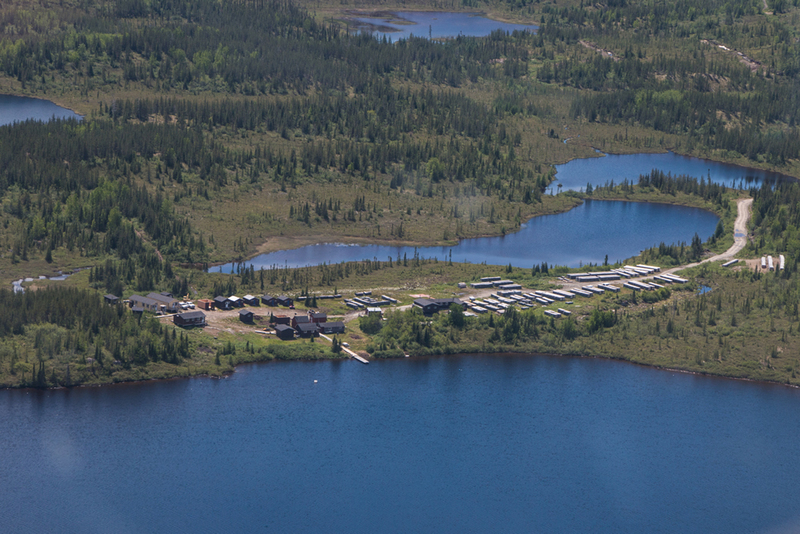 Future development of the property will require access and infrastructure improvements near EM-1 requiring consultation with the energy provider. Power production from EM-1 is 6.3 TWh/annum (Hydro Review, June 2014). 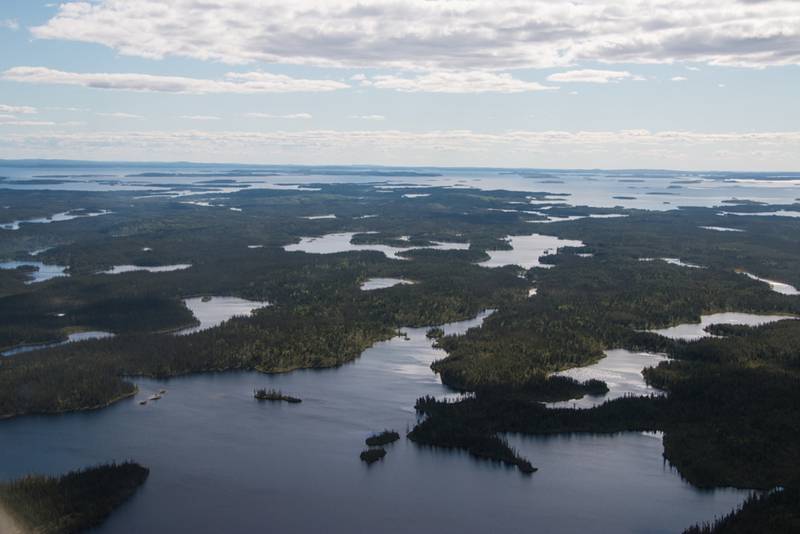 The region and the property include many lakes and rivers. 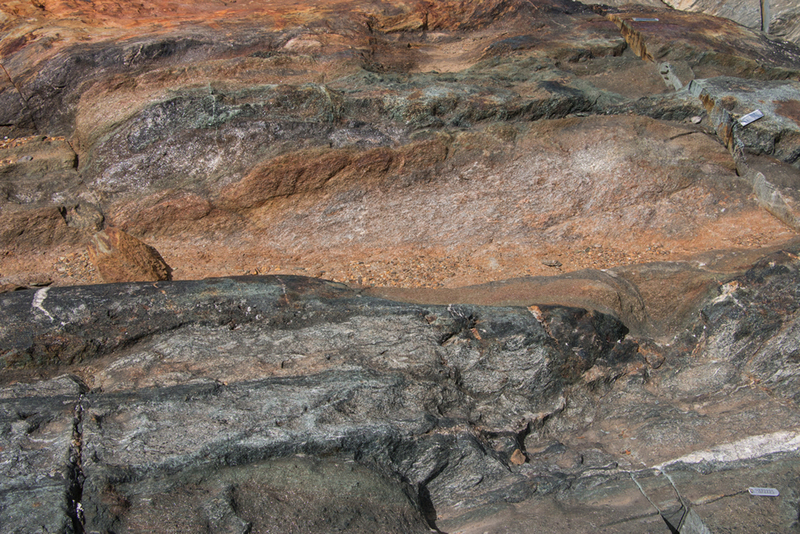 The topography is gently rolling to flat-lying with local relief ranging from 250 to 400 m above sea-level. 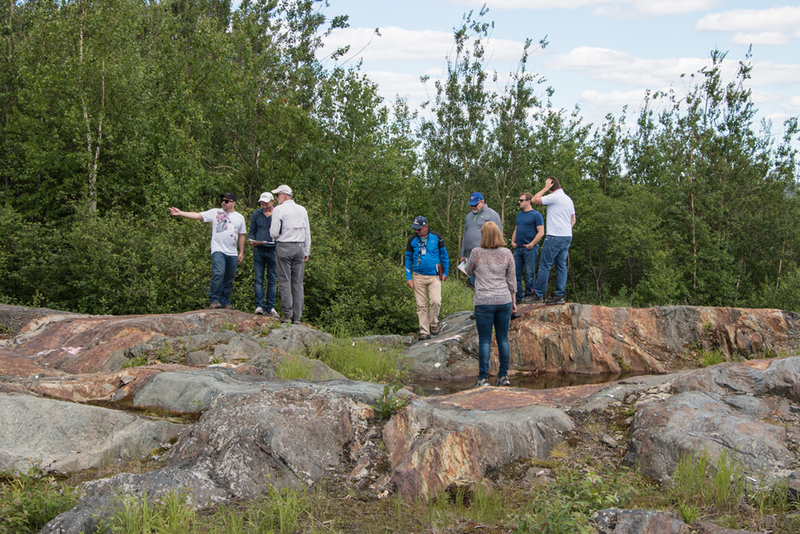 Outcrop exposure is limited. Large, east-west trending outcrop ridges and coarse sand eskers, flanked by lower troughs provide moderate drainage over most of the area. 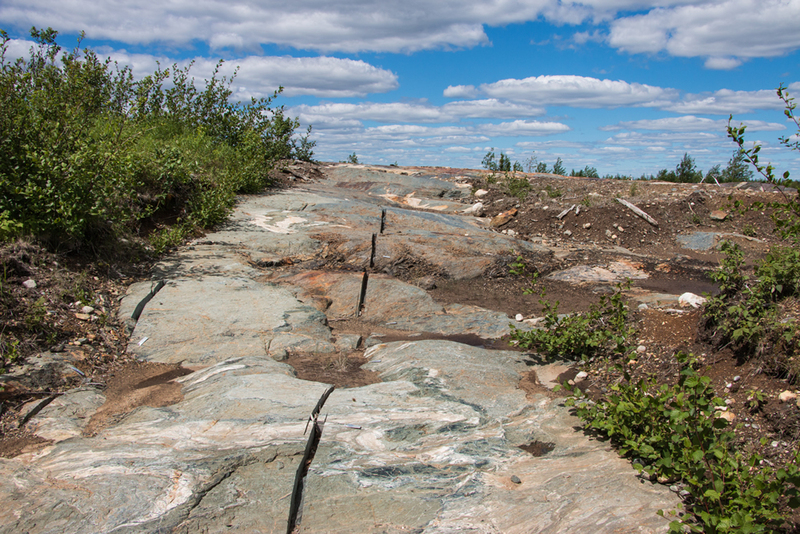 There is an abundance of quaternary deposits and swamps. 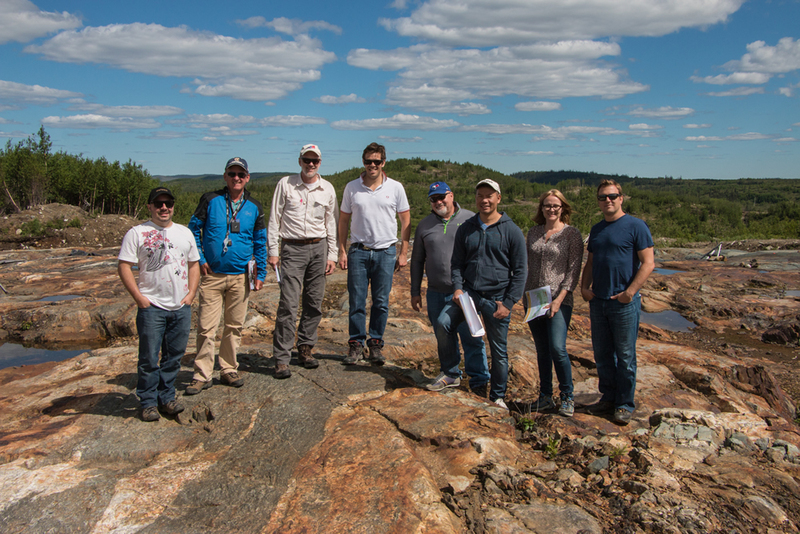 The area is drained by the Eau Claire River, which in turn drains into the Eastmain River and the Opinaca reservoir. Vegetation is common and includes large areas covered by sparse forest (mainly spruce) and many smaller mostly swampy areas devoid of trees. Forest fires have burnt much of the region in the recent past. 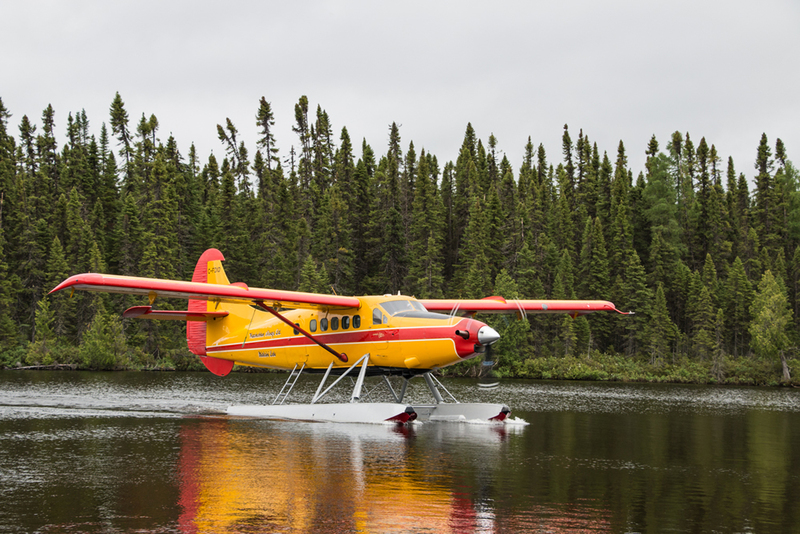 The climate is typical of Northern Canada (temperate to sub-arctic climate) with average summer (June to September) temperatures varying from 10oC to 35°C during the day and 5°C to 15°C during the night. Winters can be cold, ranging from -40°C to -10°C. Precipitation varies during the year, reaching 2 m annually, with snow cover expected from November to May. 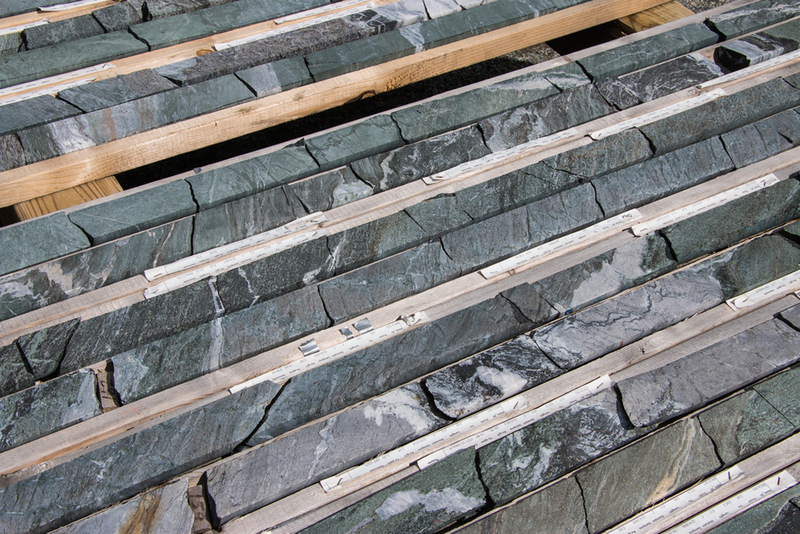 However, exploration and mining can generally be carried out year-round. 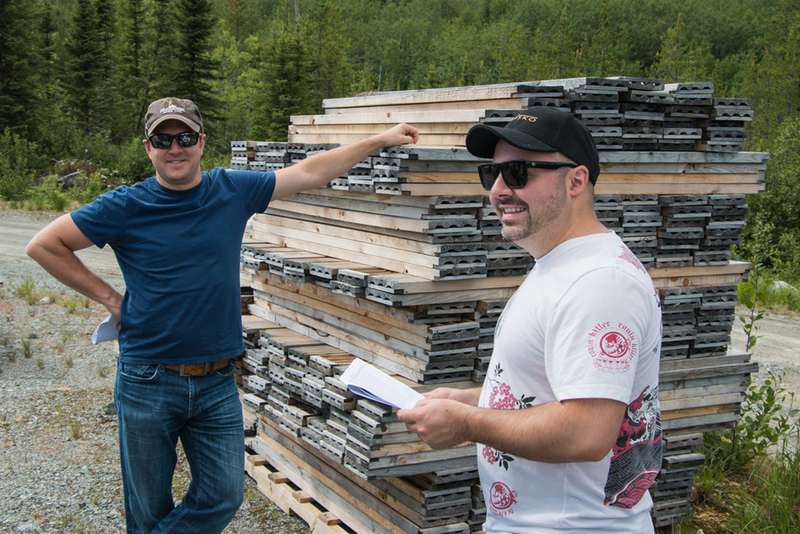 The Eau Claire Deposit is a structurally-controlled gold deposit. 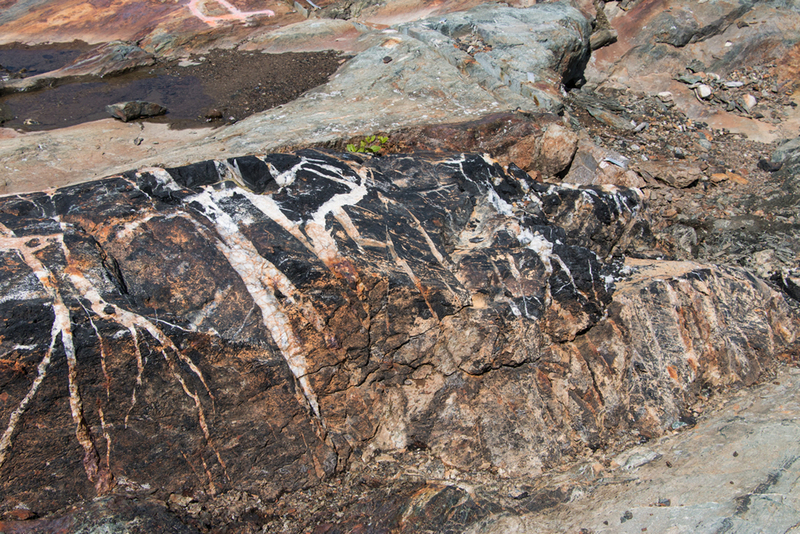 Mineralization occurs primarily in a series of sheeted en-echelon quartz-tourmaline veins; subordinate mineralization occurs as dissemination in the host rock. The en-echelon pattern is hosted within a structural corridor and trends from northwest to the southeast. 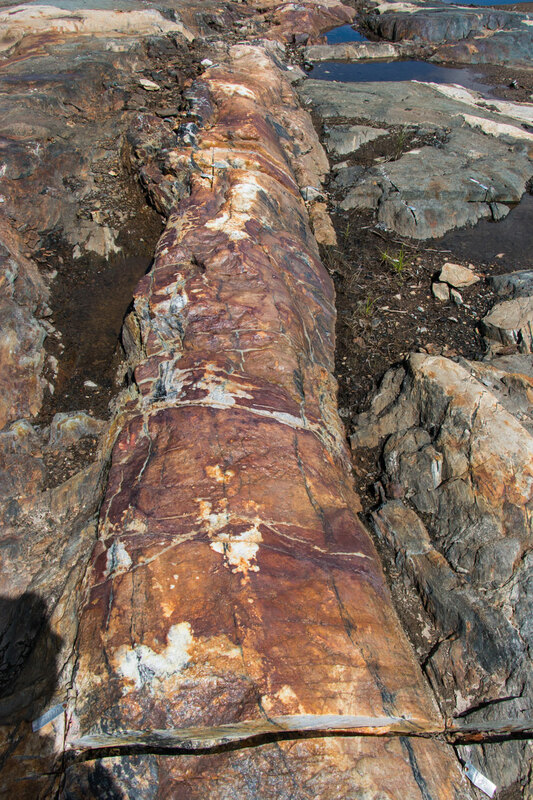 Individual veins range from less than a metre to several metres thick and extend for at least 100 metres along strike. 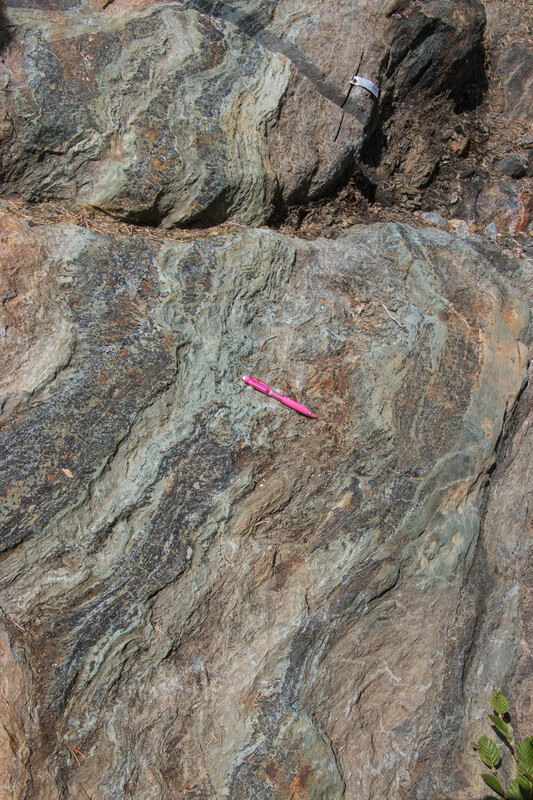 Gold mineralization at the Eau Claire Gold Deposit is generally located within approximately EW trending structurally-controlled, high-grade en-echelon quartz-tourmaline QT veins (formerly named HGV) and adjacent altered wall rocks, as well as variable width ESE trending sheared and foliated schist zones, HGS veins, of altered gold-bearing rock. 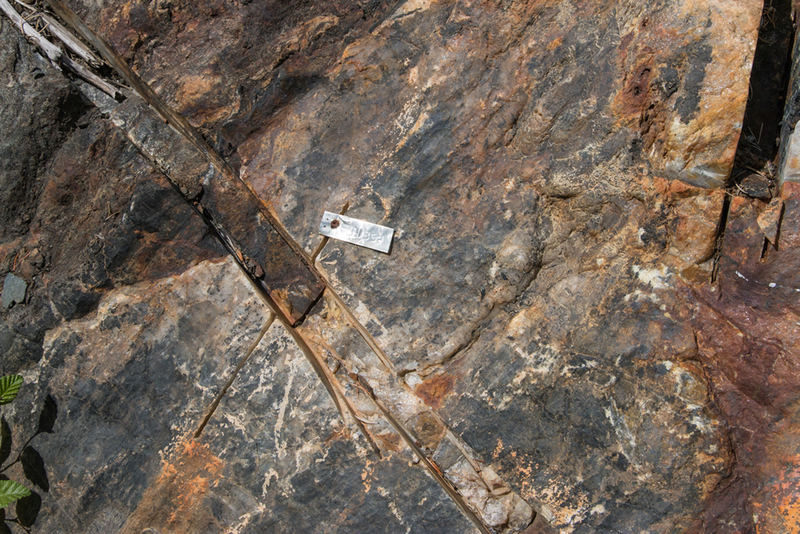 HGS zones are aligned parallel to the host rock foliation and interpreted to parallel to the southern, or hanging wall, side of the Deposit. 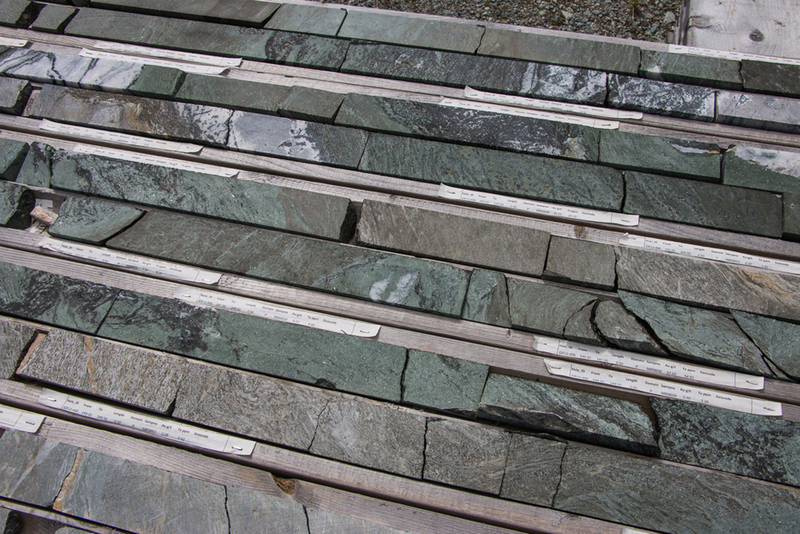 The vein systems are predominantly hosted within a thick sequence of massive and locally pillowed mafic volcanic flows, interbedded with narrow intervals of volcaniclastic meta-sedimentary rocks. 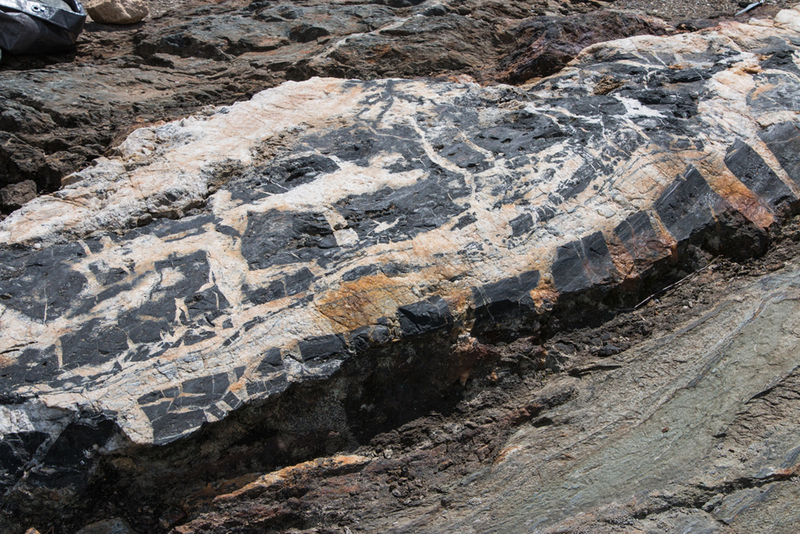 Both flows and sediments have been intruded by multiple phases of felsic and porphyry dykes. 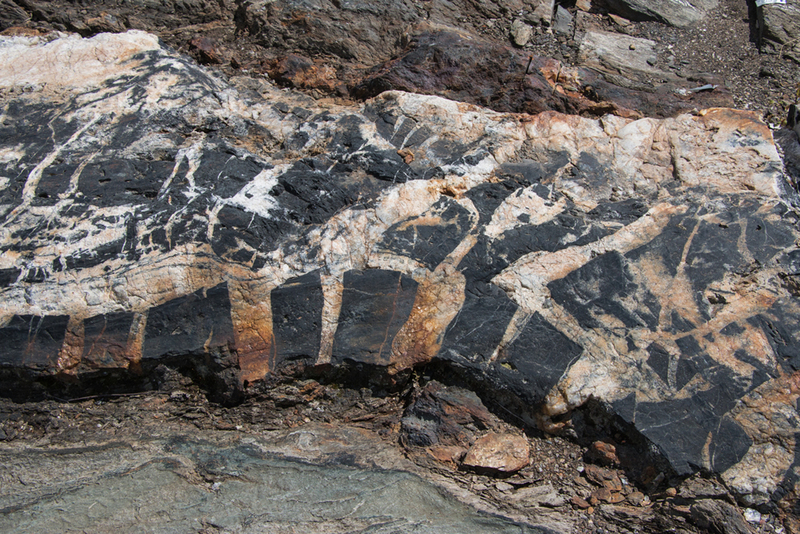 Host rocks have been folded and deformed (sheared) through several deformation events. 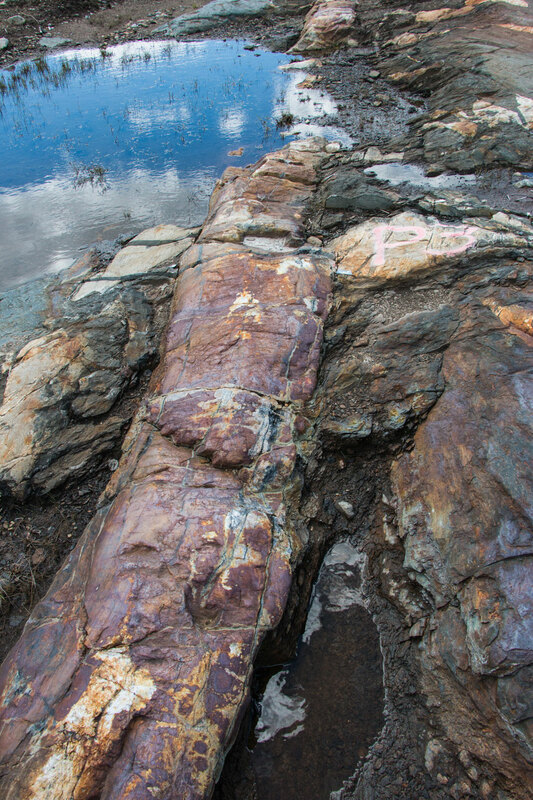 Both gold bearing vein sets may occur with as narrow intervals with tourmaline and develop into thick quartz-tourmaline veins with zoned tourmaline+/-actinolite+/-biotite+/-carbonate alteration halos which can measure up to several metres in thickness. 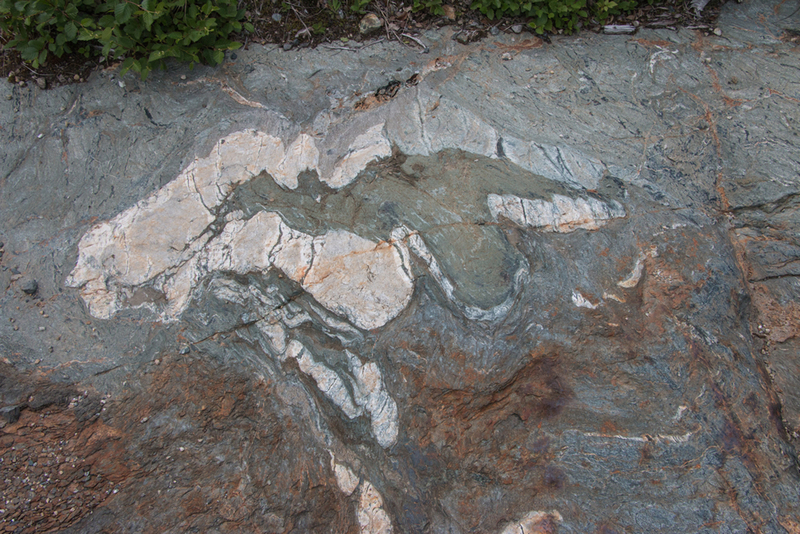 Carbonate occurs to varying degrees in the vein mineralization. 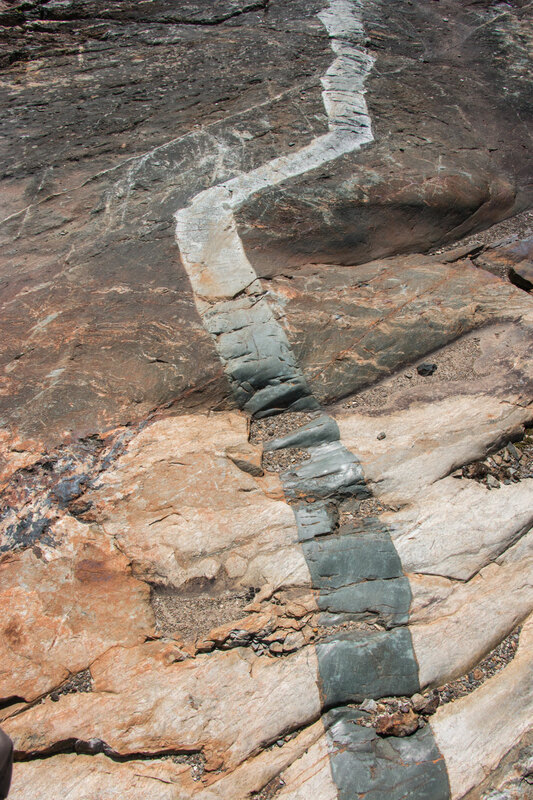 The two major QT vein areas discovered to date (the 450 West and 850 West zones) form a crescent-shaped, mineralized body 1.8 kilometres long by more than 100 metres wide, which has been traced to date to a vertical depth of 900 metres. 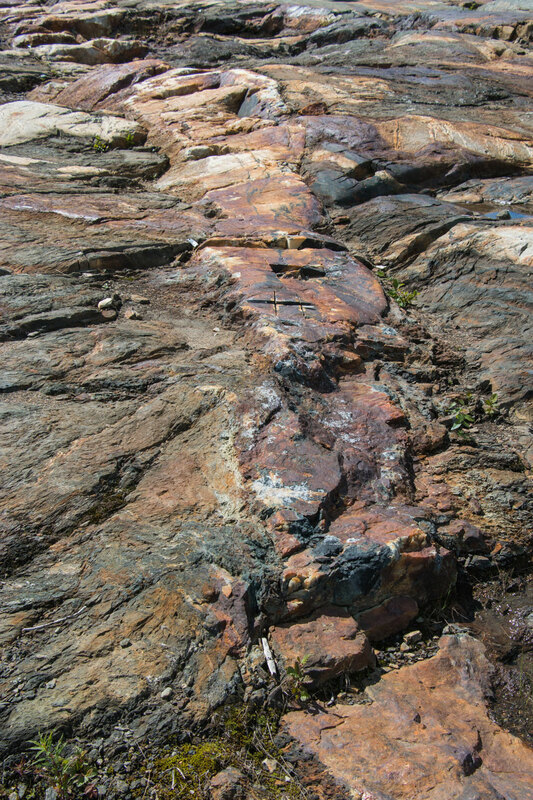 Veins within the 450 West zone typically strike 85 degrees and dip 45 to 60 degrees to the south. 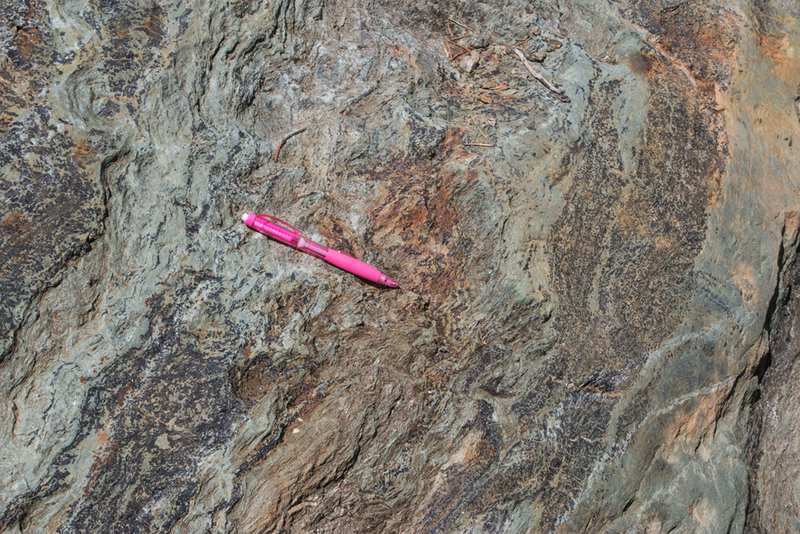 Mineralization within the veins plunges steeply to the southeast, sub-parallel to an F2 fold axis. Veins within the 850 West zone typically strike 60 degrees and dip sub vertically. 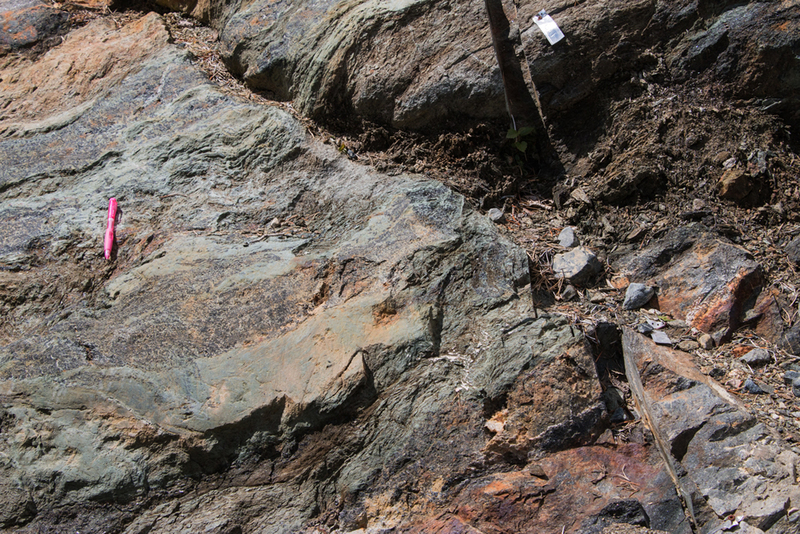 Mineralization within this vein set plunges gently to the southwest.